Noise, workplace acoustics and not having somewhere private to make calls or to concentrate are two of the most common issues we encounter when discussing office design with workers. Designing a workplace with acoustics at its core and that strives for an optimum sound level is fundamentally important, and in this piece, our team look at how workplace acoustics can have an impact and critically how they can be improved. Prominent architects, Gensler found in a recent study that 53% of workers were regularly distracted by others when trying to focus. Many workers feel that the work environment is too noisy and they can’t concentrate, and in today’s increasingly open plan workplace, this recurring problem needs to be addressed. Over recent years, one of the most prevalent office design trends has been the introduction of a variety of work spaces within the office where staff can choose to work away from their desk. 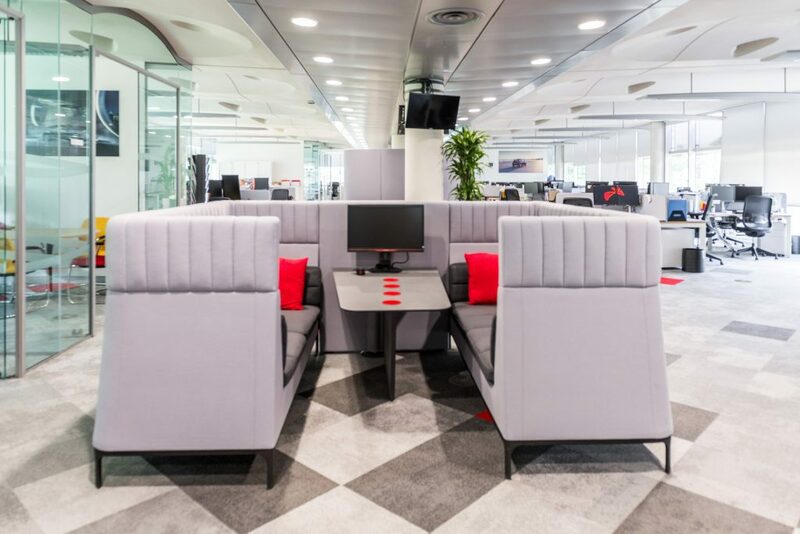 This has provided workers with the choice to work in a quieter space when they need to concentrate or to take a private call away from the open plan and to collaborate as a team in a dedicated space where they aren’t distracting colleagues. This has certainly helped matters but there is much work to do, and while there are industry norms for optimum temperature, lighting etc…, we wondered what was the optimum sound or noise level? Workplace Acoustics | What is the optimum sound level? Sound levels are measured by a unit called decibels (dB) and according to a recent presentation from Acoustics by Design that we were lucky enough to attend, the ideal dB level is 35-40 dBA. The image below provides some idea of how loud this actually is, especially when you consider that a loud radio is approx. 80 dBA and a rock concert would be approx. 110 dBA. This noise level is equivalent to the average home noise or a normal tone conversation between two individuals. However, the workplace is home to many more people so the question remains, how can office design help to create the optimum sound level? While we have mentioned introducing a variety of spaces so workers can work away from their desk, removing themselves from the noisy open plan, much more needs to be considered. Sound paths, location of potentially high-traffic or noisy areas i.e. breakout space or toilets, and critically the finishes, surfaces and textures used throughout the space can all have a major impact. Let’s take a look at each of these in detail and how office design can employ each. 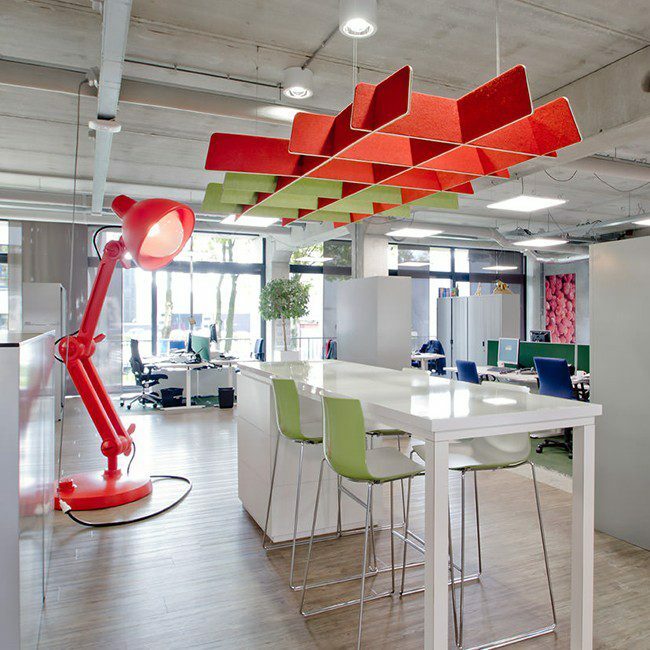 Absorbing sound at source is particularly pertinent in the open plan and busy breakout spaces and there are now numerous products available from suppliers like Buzzispace, which can be installed on walls, from the ceiling and even applied to furniture to absorb sound. Sound can also be absorbed by introducing office furniture products like high backed sofas or pods which deliver not only a greater degree of privacy but also effectively mute sounds levels. In addition, installing glazed meeting room walls that deliver a low dB rating should also be considered to prevent noise emanating outwards from large meetings. Surfaces and the materials used throughout the space are also important acoustic considerations with numerous hard surfaces and materials contributing towards creating a noisier environment. To achieve an optimum noise level, we would recommend using additional noise-absorbing materials on applicable surfaces. Blocking noise is possible through the strategic placement of screens, barriers and walls between the noise source and work areas. Desk dividers are commonly used to block noise between desk positions in the open plan while other options include enclosed pods, ceiling buffers and fabric panels, all designed to effectively block noise. Spending some time defining the layout of any workplace is also key as the position of barriers like walls, dividers and partitions is key when it comes to maintaining an optimum acoustic level. The higher and wider they are, the more effective they will be but of course, they’ll need to also look good too. The ceiling space can also be used to block sound transmitting and travelling through the installation of ceiling panel with acoustic value and possibly attractive features that also serve to block noise. Covering unwanted noise literally says what it does on the tin and when applied to a workplace setting, means covering hard surfaces with a material that has acoustic value. Nowadays, you can just wrap a wall, pillars or any previously hard surface in a soft fabric decreasing unwanted noise – the key is to apply it in the right and particularly noisy zones within the workplace. Additionally, coverings in general, from flooring to partitions need to be considered and we’d recommend working with a specialist acoustics company like Resonics to carry out a survey in the first instance before allowing them to make some recommendations. The ABC of workplace acoustics are the fundamentals to consider and bear in mind but there are numerous other elements. These include creating noise-free private refuges where staff can lock themselves away, situating noisy teams like sales, marketing or customer service who are on the phone a lot away from traditionally less noisy teams like HR, finance or IT. It’s also worthwhile to educate and train staff on acoustics and workplace noise so they are aware of best practices and how to reduce noise in the office. 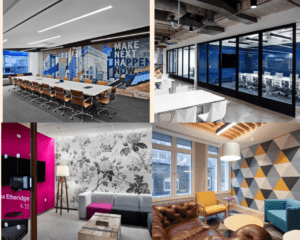 Our team would be happy to discuss creating a workplace with an optimum sound level, so feel free to get in touch at any time via the form below or by calling us on 0207 697 4670 – we’d love to talk more.